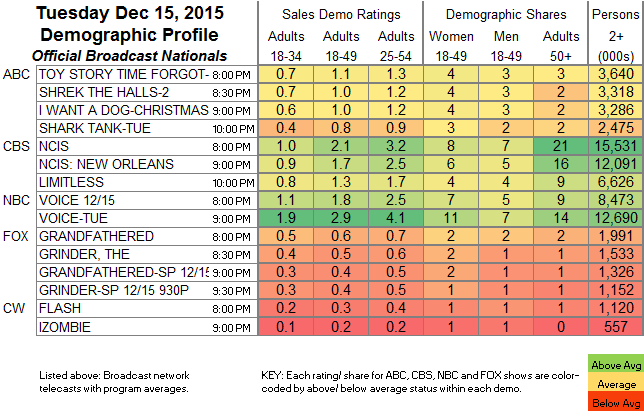 NETWORK UPDATE: NCIS: NEW ORLEANS gained 0.1 in final numbers. CABLE HIGHLIGHTS: The REPUBLICAN DEBATES continue to be the hottest shows on television that don’t feature a football, zombies, or the Lyon clan. CNN’s coverage gave the network a huge 3.84 rating, with over 18M total viewers. Even the first round of the debate, featuring the also-rans, was at 0.98, and other related programming gave CNN 6 of the night’s Top 10 slots. Elsewhere, CURSE OF OAK ISLAND (History) was diminished by 0.16 to 0.78, and HUNTING HITLER fell 0.12 to 0.40. BET’s BEING MARY JANE, though, jumped by two-tenths to 0.68. Bravo’s REAL HOUSEWIVES OF BEVERLY HILLS declined by 0.06 to 0.62, and GIRLFRIENDS GUIDE TO DIVORCE was steady at 0.25. On A&E, MARRIED AT FIRST SIGHT dropped 0.07 to 0.51, but BORN THIS WAY was up 0.06 to 0.29. Discovery’s MOONSHINERS crashed by 0.26 to 0.55. On USA, CHRISLEY KNOWS BEST dropped a tenth to 0.49, and DONNY took a 0.11 hit to 0.10. On Food Network, both CHOPPED and CHOPPED JUNIOR were at 0.36, respectively down 0.12 and 0.04, and GUY’S GROCERY GAMES was at 0.28. 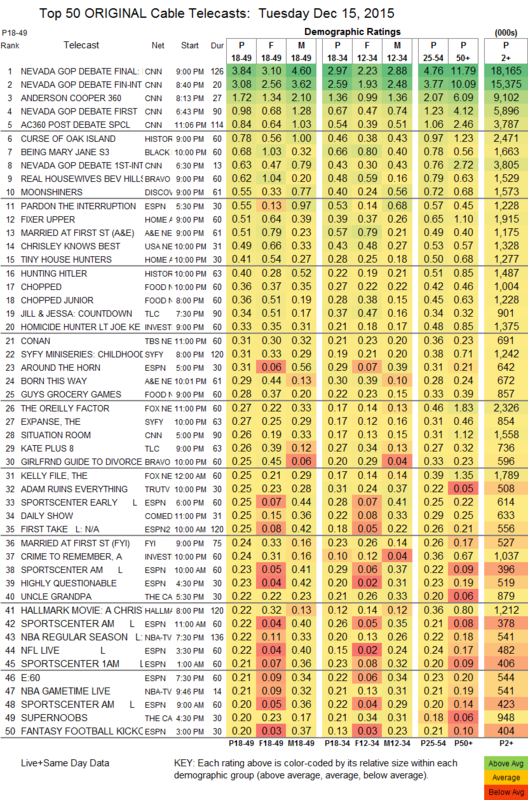 TLC’s JILL & JESSA was at 0.34, and then KATE PLUS 8 fell 0.11 to 0.26. The news wasn’t good at Syfy, where the 2d night of CHILDHOOD’S END dropped 0.12 to 0.31, and THE EXPANSE lost 0.06 to 0.27 (and also fell below 1M total viewers). That’s as bad or worse than Syfy has done with its low-budget scripted programming. The 2-hour season finale of MTV’s FINDING CARTER remained at 0.18. That was a smash compared to the season finale of WGNAmerica’s MANHATTAN, which burned through 0.02 to 0.03/201K.